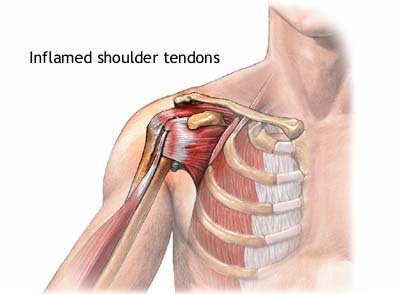 Shoulder tendonitis is identified by the inflammation and swelling of a rotator cuff tendon due to irritation. Tendonitis most commonly occurs at the site where the tendon attaches to the bone and along the length of the tendon near the area where the muscle and tendon connect. The tendons are band-like structures of fibrous tissue that adhere the muscle to bone. There are many tendons found within the human body, varying in size, from the larger tendons found around the joints on the knee to the smaller tendons found on the fingers. If these bands of tissue become irritated, they begin to swell and become inflamed. Shoulder tendonitis, or rotator cuff tendonitis is among one of the most common sites for damage or injury to the tendon on the shoulder. Overuse of the tendons during work or sport-related activities is often the most frequent cause of tendonitis. Constant and repetitive overhand motions, lifting heavy objects, or direct injury to the shoulder from a blow or fall to the tendon can all develop into tendonitis. Aging can make people more prone to developing the condition as well. With age, the tendons begin to lose elasticity and fluid content, making them more susceptible to irritation, inflammation, and swelling. Lastly, other conditions such as rheumatoid arthritis or osteoarthritis, can cause changes to the tendons. Shoulder tendonitis symptoms most commonly include shoulder pain with increased tissue temperature, swelling, and redness. 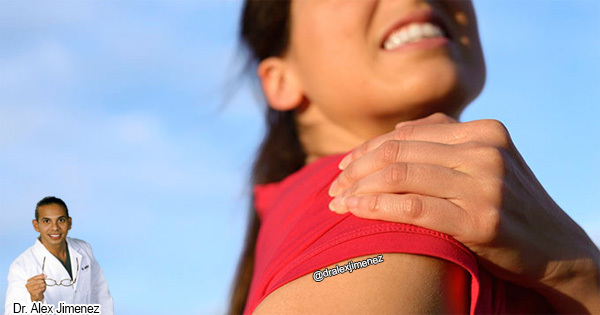 The pain associated with shoulder tendonitis can start as a dull ache and sharpen as a person moves the shoulder, most notably when raising the arm overhead. Inflammation then causes swelling and tenderness on the shoulder. If left untreated, stiffness and restricted range of motion could occur.